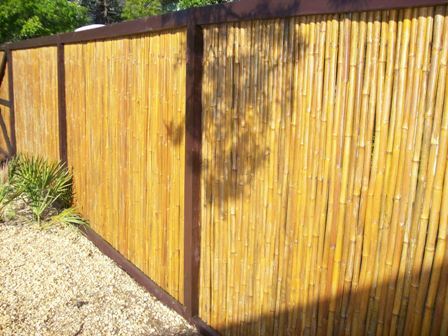 Looking for bamboo fencing photos? 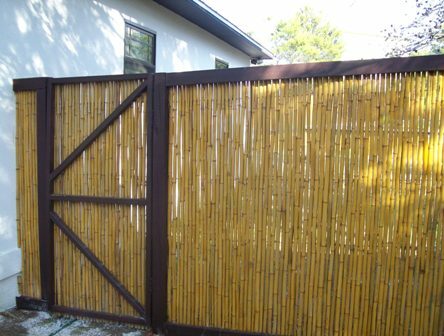 We recently completed an installation of a long stretch of bamboo privacy fencing in northwest Florida. The photos appear below. This installation was done in a sandy environment, which will help with the longevity of the fence posts, which are buried 3 feet deep. The posts used were 4x4 pressure-treated pine. A "picture frame" style was used here, and a reddish outdoor stain was applied to the pine frame. This gave a nice contrast to the bamboo. The bamboo has been treated with a special weatherproofing that is light years better than the products you'll find in large home improvement stores. We used Amteco's TWP 300 series (the color was 315, light cedar). But, it's very important to note that we allowed the bamboo to dry (and crack) for a good 6 months until it was completely a weathered grey BEFORE applying the TWP. That allowed the surface to be more receptive to the treatment. The pine posts were allowed to thoroughly dry for 6 months before applying their stain, as well. This is especially important in a humid environment such as Florida. This image shows a gate that was constructed with 2x4 pressure-treated wood (pine). The pattern was chosen to ensure more stability when opening and closing the gate. This photo shows how the fence was brought right to the side of the house. Bamboo fencing is a unique, beautiful alternative to other types of fencing. Plus, bamboo is a sustainable, renewable resource. 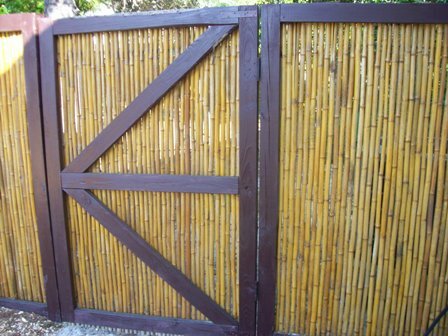 Using bamboo fencing definitely adds a WOW factor to your home! Return to Bamboo Fencing from Bamboo Fencing Photos.